So much has happened in a few weeks that it would be impossible to update you all in 1 blog and so I have split the blog into 2 parts. This is Part 2. Quest ( front left) Merlin (front right) and Henry ( rear) on our training day in Plymouth yesterday. We had a fantastic training day and to finish we decided on a group photo next to a wood pile. Henry decided he much preferred being on top of the wood pile. We covered tracking, the down stay, the look, article searching in woodland and person searching in woodland. 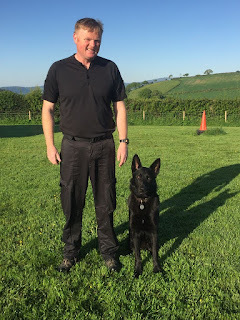 Peppe and Elsa are also in this group for the Initial course. Merlin is pictured here with puppy walker Ian. Merlin is a very highly determined and driven dog who loves his work. 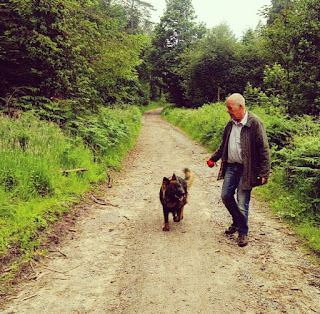 He is pictured here following a 50 metre trail for his ball hidden at the end of it. 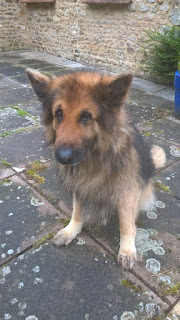 He has a lovely nature and is totally non dog aggressive which is quite rare in the modern German shepherd these days. Quest is pictured here with puppy walker Colin. I was very impressed with Colin’s control with Quest. Quest has ferocious determination, a very strong play drive and is a very powerful dog. Quest is pictured here having located his toy at the end of his track and Colin demonstrates that he can play vigorously with Quest but can still get him to leave the toy on command and Quest will then wait patiently to continue the game. I normally introduce the person search exercise with the dog on a lead but Quest is so powerful trying to run with him on lead in woodland would result in a broken ankle. I did the exercise off lead and his intelligence and clear head meant he quickly worked out sitting back and barking got him his toy. This incredible dog is certainly on my radar as a future Stud dog. Henry is a very powerful athletic agile dog and like most Dutch herders and Malinois has a strong genetic propensity to bite. Puppy walker Jill works regularly on his environmental work because he still has difficulty sometimes dealing with new situations and locations. His food drive is incredibly strong and Jill uses this to develop his focus exercises. Here they are demonstrating the sit and look exercise and also his down stay. Jill and Terry have done an incredible dog looking after Henry who is a real handful but has no malice in him whatsoever. What is abundantly clear he has the potential to do enormous damage to any criminal foolish enough to take him on. 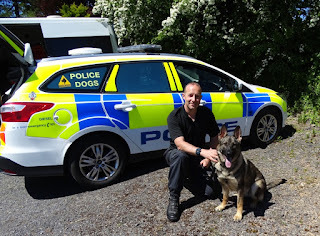 For that reason the time is now right for him to go to an experienced Instructor or handler to harness his potential. I am looking to progress this in the coming weeks. Peppe is pictured here with Graham Attwood who is the course Instructor for the September Initial Police dog course. 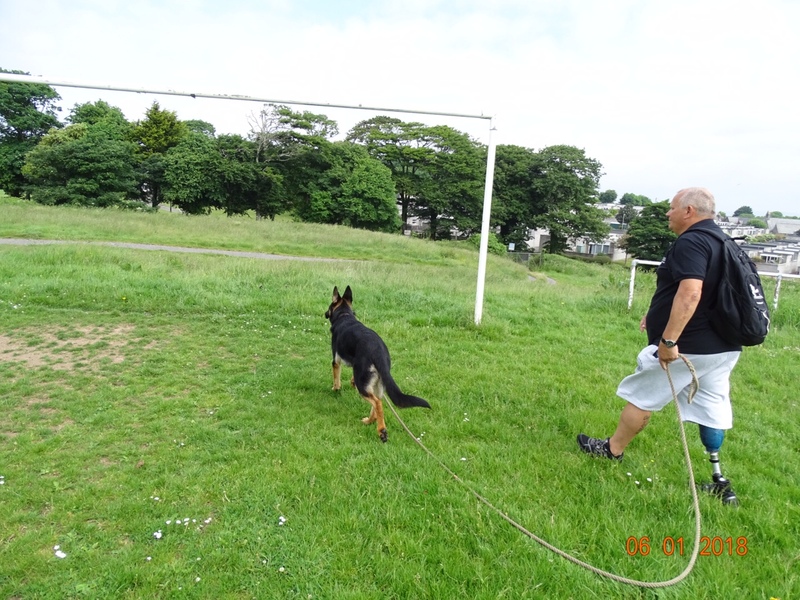 Graham is puppy walking Peppe until a handler becomes available to take him on the September Initial course. Graham is a very busy man and so doesn’t get the opportunity to attend our puppy classes. 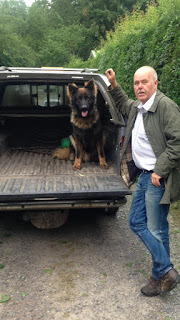 Graham assures me that Peppe is a very confident dog with very strong working drives and great potential. Peppe was originally puppy walked by Chris Walter and his family. 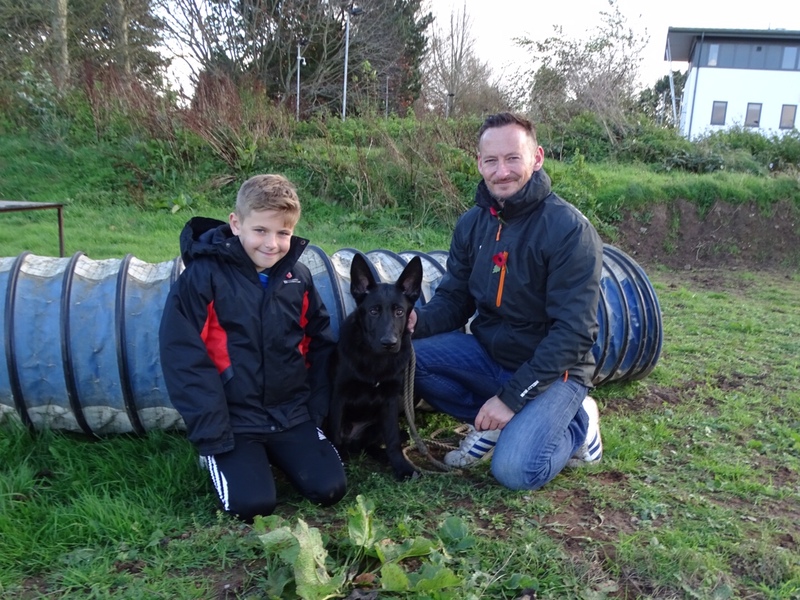 He is pictured here on a training day with Chris and his son Henry. Peppe was transferred to Graham to enable Chris and his family to look after one of our potential breeding females Elsa. 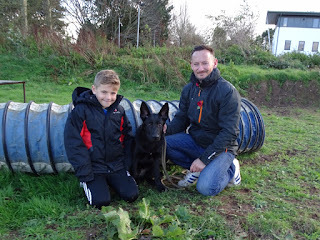 Elsa is pictured here with Chris and his family and the hope was that she would become one of our 3 breeding females. Our other two breeding females are Sasha and Ella. 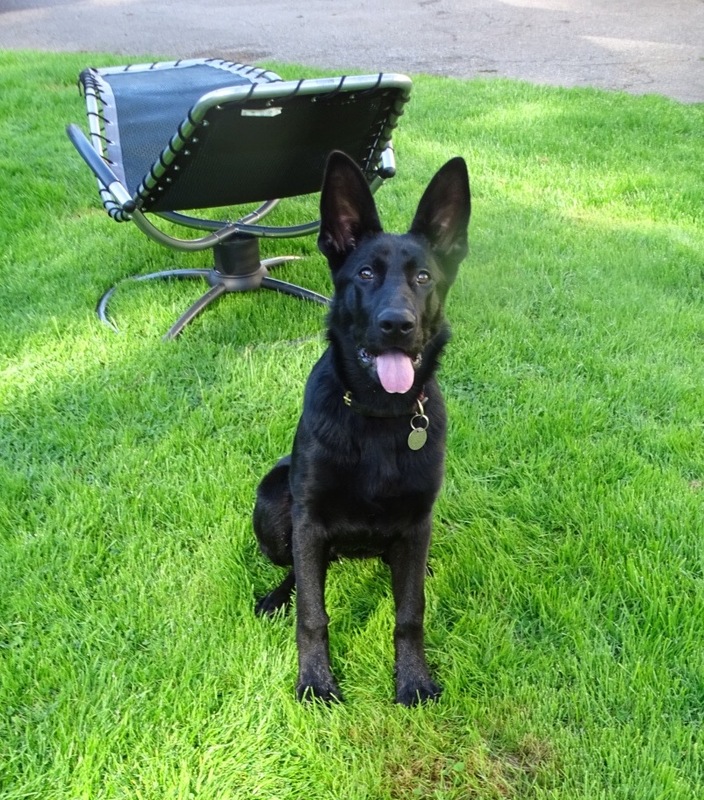 Elsa had her hips screened when she was10 months and our vet was confident they were very good. 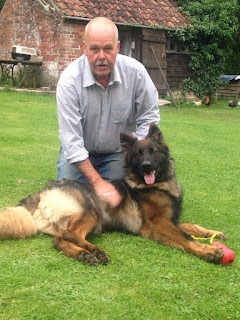 On that basis we decided not to use her as a General Purpose Police dog and place her with Chris as one of our breeding females. She had been previously puppy walked by Steve Pearce and his family. Here is Steve on a training day with Elsa. Her hips and elbow x rays were retaken a month ago when she was 14 months old and submitted to the British Veterinary Association to be scored officially. Unfortunately they have come back not quite suitable for breeding but more than suitable to be a working dog. Elsa will now join the Initial Police dog course in September. I’m really disappointed for Chris and his family who were hoping to keep her for many years to come and have several litters of pups for us. 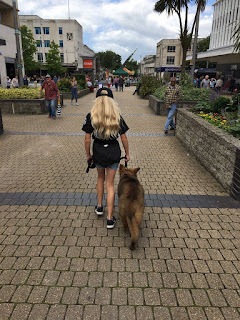 As I reported in my previous blog I removed Gunnar from his puppy walking family because he had shown aggression towards 11 year old Isabel and also her mother Hannah. The catalyst had been Isabel going to get his empty food bowl from his crate to prepare his meal. He also growled at Hannah during the same incident. The family had grown up with Gunnar since he was imported from Germany at 15 weeks of age. It was particularly upsetting for Isabel as the two of them had been inseparable growing up. 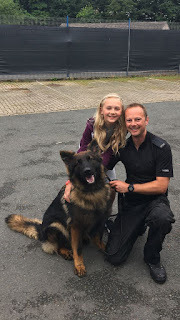 It was clear to me that it had coincided with Gunnar going through his teenage stage and so my objective was to take him home to observe his character close hand and look at his potential to be a Police dog. There had been several other incidents involving Gunnar behaving unusually towards Isabel which is why I removed him. I thoroughly enjoyed having and working with Gunnar him and although his working determination was not at the level I would have liked he did improve as the weeks went on. 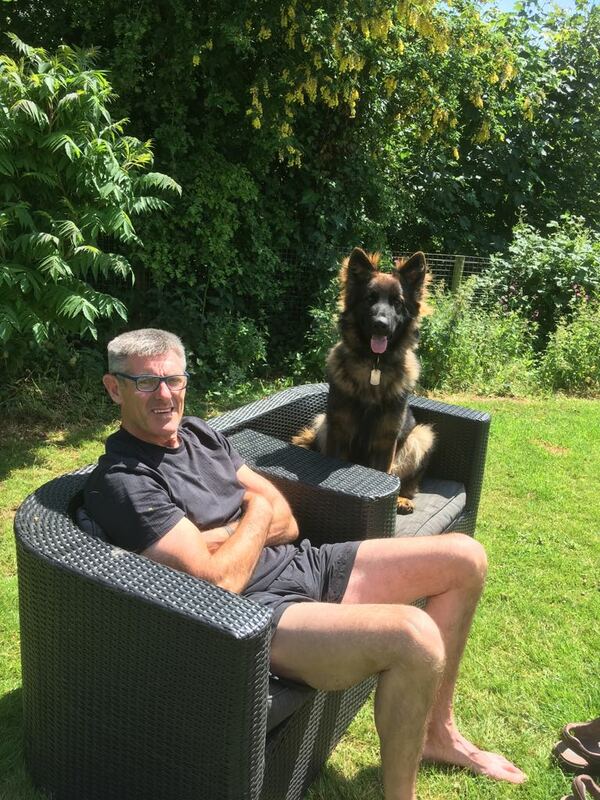 I took him everywhere including the Devon county show and he was generally very confident but there were odd occasions when he was unhappy with people approaching him on lead and incidents of possessive aggression over a bone and a tugging toy. 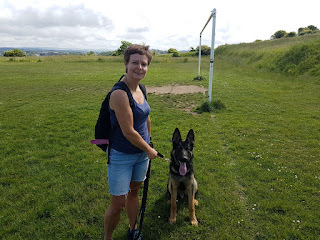 My conclusion was that he had many good qualities but that his possessive aggression, excitability and lack of determination in certain exercises meant that we shouldn’t continue to train him as a Police dog. His outstanding qualities were his tracking and boldness. Here he is following a trail I laid for him around my garden. I have no doubt an experienced handler could have developed and handled him and he would never have shown aggression to his own handler. But I was aware that it was unlikely I could find a puppy walker experienced enough to look after him until September and with 4 other pups in our program waiting for handlers we probably wouldn’t have required him anyway. He was so happy to see them and there was no sign of any issues with Isabel. Witnessing him being reunited it was hard to believe that he could have shown any aggression towards his family but there is no doubt that in different circumstances there is a degree of aggression lurking underneath. I informed them of my decision and they fully understood. My decision was also influenced by the potential new home on offer for Gunner. 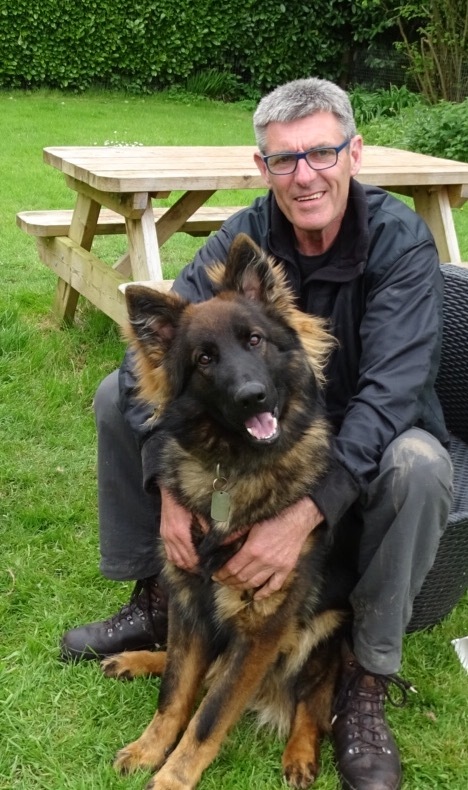 My colleague Chris Burridge a fellow Police dog Instructor in the Alliance had re-homed his own young Trainee Police dog Ace 10 years ago with the Water Bailiff at the Longleat Safari park Nick Robbins. Nick was now looking for a new young dog because poor old Ace who has served him well is now 12 and going off his back legs and can’t work anymore. I gave Gunnar a last groom before setting off to Nick’s home. As soon as I met Nick and his partner and his old dog Ace I knew it was the home for Gunnar. I took a photo of Gunnar and Nick by one of the many lakes he is responsible for. I drove away knowing that Mark and his family would be very happy with Gunnar’s new home. Nick has said Mark’s family are more than welcome to visit his home or meet at Longleat where Nick has worked for 31 years. He has certainly settled in well and Nick tells me he does everything but drive the 4x4. Here is Quini on the left with her brother Quest at my house just after I brought them both back from Belgium. The bad news is that Quini has failed her hip x rays to be a Police dog. Our vet says she can lead a perfectly normal life as a pet but cannot undertake the rigours of working as a Police dog. She was due to be allocated to her handler Chris Carter in North Devon. We are now looking for a good home for Quini and as always we will not be rushed until the right home is found. All of Quini’s relatives have excellent hips and so does her litter brother Quest. I'm afraid the dreaded hip curse strikes yet again. 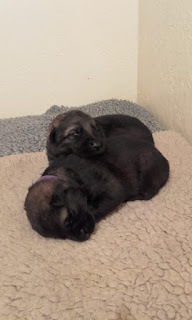 We have been so impressed with Eric and Elsa from Kazzardsway breeding in Manchester that we have placed orders with Bernard the breeder for further pups. Nico and Nero are still less than a week old and we hope to collect them in 7 weeks time. I finally picked up my 6 month old Dutch import Larry from Mary last week. I would like to end by thanking Angie Collins, her husband Graham and Mary for looking after Larry for me until I was ready to take him. With all the comings and goings and puppy walkers going on holiday puppy walkers Mary and Margaret have been a fantastic help to me and the puppy program by looking after so many pups short term while people have been on holiday or needed their pups looking after. From me, my new dog 6 month old Larry and Ella bye for now. So much has happened in the last few weeks that it would be impossible to update you all in 1 blog and so I have split the blog into 2 parts. Here are the E litter on our last training day. From left to right are Ernie, Errol, Echo and Eyke. We gave Eddie the day off because he had worked so hard representing the puppy program down at the Cornwall county show. At the E litter training session we worked on resilience exercises, obedience, recall’s, article searching and line work. I had planned an introduction to tracking but it was too warm and dry. Ernie has settled in well in his third home with Bill and Vivian. The two enforced moves were no fault of Ernie and I am optimistic that this will be his last puppy walking home. Bill and Vivian tell me they cannot fault him and are enjoying having him. Ernie is pictured here recalling to Bill. Errol is coming along really well. He is pictured here with Sue throwing his toy into long grass for him to locate and relaxing together watching the other pups work. Environmentally we have had some early issues with him lunging and barking on meeting other dogs. Initially we used a corrective water spray which had the desired effect. This has now been replaced by gaining his attention with the sit and look for a titbit if another dog is in the vicinity. Sue has worked hard and is already making excellent progress with Errol. Unlike her litter mates Echo is not particularly food crazy but her play drive is so strong everything is easily achieved through play. Here is a video I’ve shown before of her natural desire to play and interact with people. She is exactly like her mum Sasha with incredible focus and drive. She is a happy, biddable playful pup who would happily play all day long. Here she is with Michelle learning to walk on the long line ignoring other dogs and distractions. Eyke as I expected has been the most challenging in the group in terms of his strong willed determined character. He is a high energy pup who needs an outlet for his exuberance and he needs firm but calm guidance to channel his energy in the right direction. I have visited the family several times to give guidance on preventing Eyke attempting to chase cars and to stop him from biting the children when he gets over excited during games with them. He is not the easiest pup but then the pups that go on to make outstanding Police dogs rarely are. Rob and his family are doing very well and things will improve as he learns exactly what is required of him. Here is a video of the pups taking the increased height on the ramps all in their stride. Another successful training session which I hope the pups enjoyed as much as I did. Meanwhile down at the Cornwall county show here is Eddie with his pal taking a breather and sheltering from the warm sunshine. Eddie also found people dropping out of the sky very interesting. 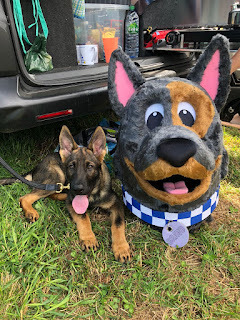 He was joined down at the Cornwall show by Sydney from our January 2019 pups. Here they are clearly enjoying each other’s company. 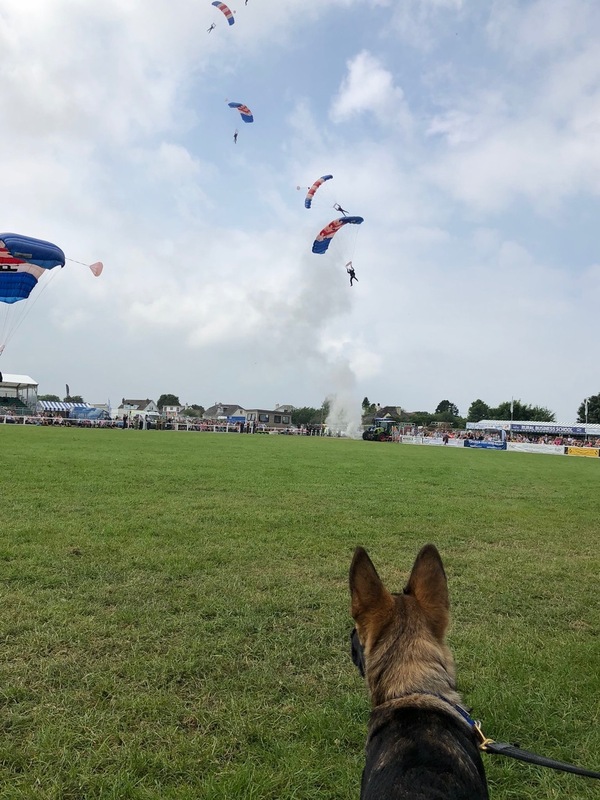 My thanks to Alaina and Phil for taking their pups to the Cornwall county show and to Cornwall dog section supervisor James Little and his team for making them so welcome. There have been quite a few changes in our January 2019 group pictured here from left to right Ben, Larry, Star, Bill, Sydney and Lola. 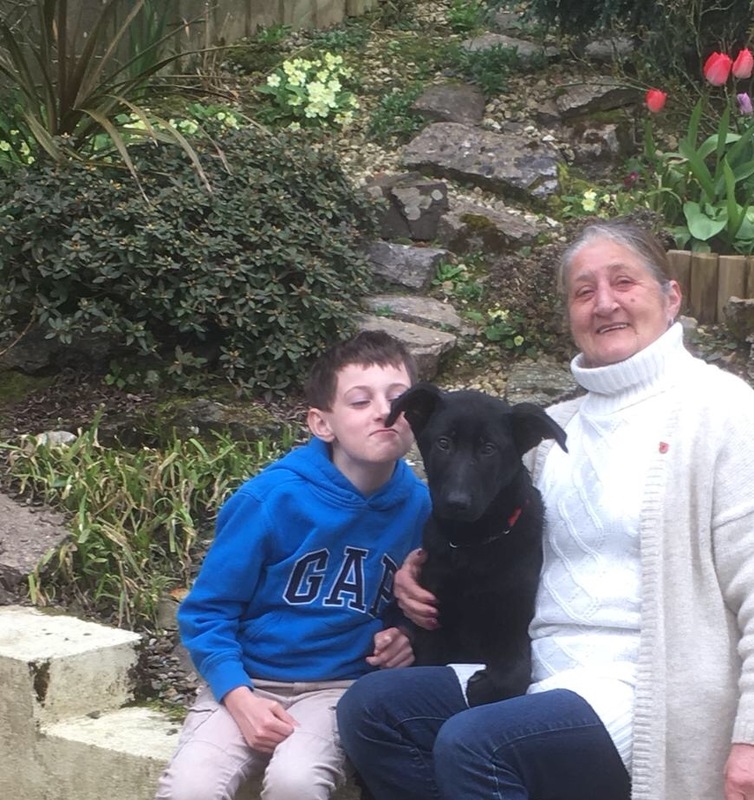 Ben as previously reported had to go to a new home as his puppy walker Lyn has had some health issues and was unable to continue with him. Ben the best possible start on the first stage of his journey. His new home is with Stuart, Wendy, Jacob, Lauren and Lexie in Plymouth. He has certainly made himself at home and is enjoying the family’s active lifestyle. Stuart and Wendy are first time puppy walkers and so the first job was a crash course for Stuart on how to walk Ben on lead and on his training line. Stuart has now cascaded this to his wife Wendy. 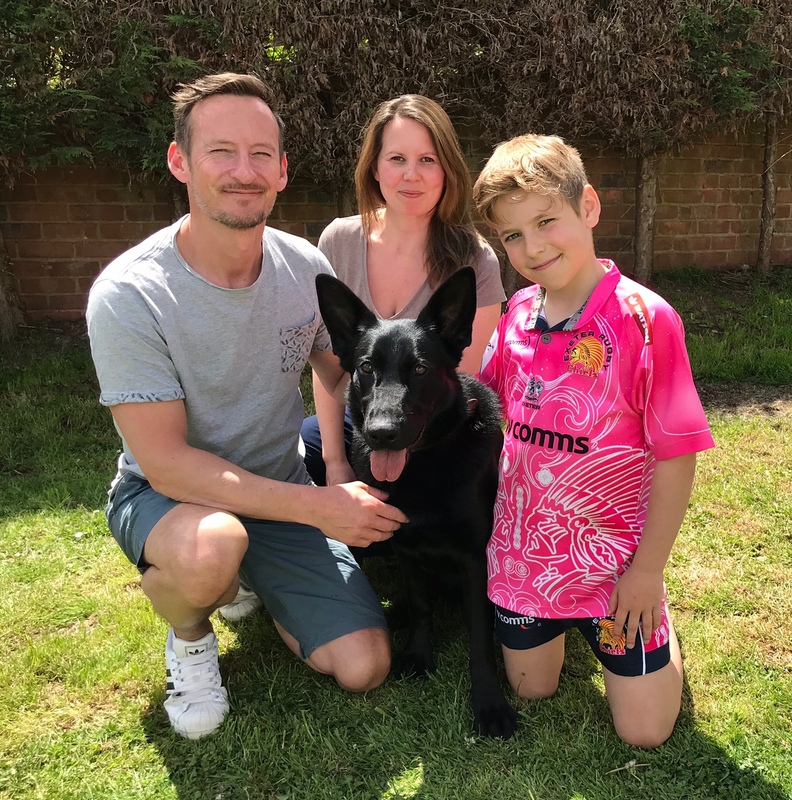 Taking on a very powerful and active dog like Ben at 7 months is not an easy challenge but Stuart, Wendy and the family have made a great start. They certainly showed that they are not put off by a bit of rain on our training day yesterday. Pictured here are Star, Ben and Sydney. Here are a few pictures of a very wet day. Stuart how he follows a trail. Sydney and Phil enjoying some article searching in the woods. 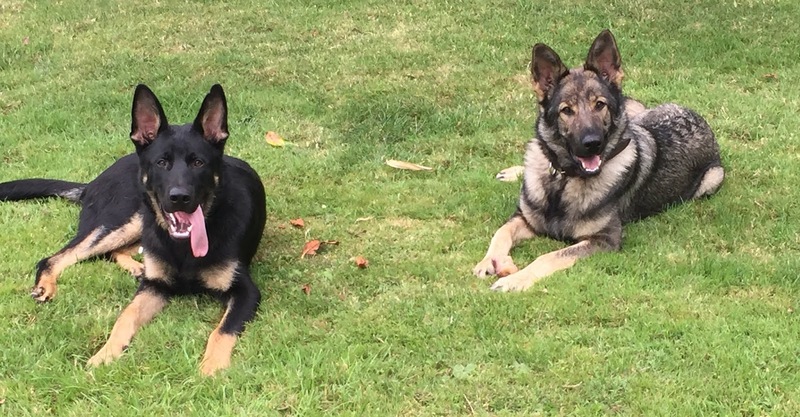 Star pictured here with puppy walker Margaret was imported from Holland along with his brother Sydney and Larry on the 4th of April 2018 when they were 4 months old. I purchased Larry as my own dog. Star and his brother Sydney were purchased for our puppy program. When they arrived Star and Sydney were allocated to puppy walkers Margaret and Phil. Angie & husband Graham agreed to look after Larry for me while I raised the E litter. The 3 boys are pictured here at the Devon county show watching the horses. Star is front left, Larry rear and Sydney front right. It was soon apparent on our training days that Sydney and Larry were very confident dogs but Star was nervous of some men and particularly me if I got too close to him. Here he is when I tried to do some individual training with Star and Margaret and I got too close to him. We have imported many dogs from abroad but because of the rabies laws we cannot collect them until they are 15 weeks old. This invariably means that they have missed out on that vital socialisation between 8 and 14 weeks. Considering the dogs had not had that socialisation they were very confident at the Devon show. Larry, Star and Sydney are pictured here taking in the fairground. Margaret went on a 2 week holiday in late May and so I took the opportunity of having him at my house to gain his confidence and to take a closer look at him. For the first 2 days he was extremely nervous of me and attached himself to my wife. I then kept him on a lead with me almost continually to prevent him running away and hiding from me. I instructed my wife to ignore him and within 2 to 3 days he accepted me and I then began training him to search, track and play tug. He certainly enjoyed the second week with me and loved being around my female Ella who just oozes confidence and definitely took him under her wing. Here is a short video of me playing with Star and in such a short time I was really pleased with the improvement. I have had a long chat with puppy walker Margaret who lives alone and suggested that he probably needs a busier environment and she agreed with me that it would be better for Star if he went to a more experienced puppy walker with regular access to meeting men and monitoring his progress. I would like to thank Margaret for all the work that she has put in with Star . I have placed Star with retired Police dog Sgt Alan Knight and his wife Fran and daughter Maddy. Police dog at least we will have better prepared him to enjoy the rest of his life. I can just hear some of the more unpleasant people who inhabit social media ranting that we are a professional Police force and not a charity and that this all costs public money. Fortunately I work for a Police force that trusts its handlers and instructors to do what is right for their dogs. Lola and puppy walker Karol couldn’t make our Sunday training session due to a family bereavement in Poland. 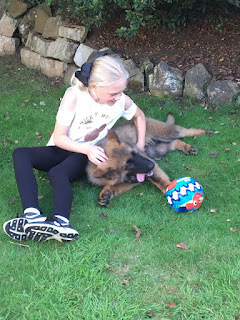 Lola has been developing really well but last week I had to visit the family to deal with an issue where Lola had shown aggression towards Karol’s mother Anna. The family are pictured here with Lola when she arrived in February. Left to right are Dad Steve, daughter Christina, Karol and mum Anna. The incident occurred when Anna’s husband Steve allowed Lola to sit on the sofa with him (as he often does) and when Anna came into the room Lola growled at her. Karol had then tried to intervene by grabbing Lola and tried to drag her to her cage which resulted in him getting some superficial bites to his arms. Here is Lola with Anna and her husband Steve at the Devon show. Had husband Steve just got up and walked out of the room as soon as she growled the incident would have been defused without any escalation. No further problems have occurred since I introduced an action plan for the family. This required not allowing Lola onto furniture and her playmate and general softie dad Steve having to ignore her. I suspect Lola sees him as a soft touch and sees him as a play resource and is jealous of his wife Anna being involved in their relationship. I also needed to give some instruction to prevent Lola pulling on the lead on her walks. I demonstrated to Karol how to use her energy and desire to charge forward to his advantage by just stopping dead and work in changes of direction and short recalls for a toy game and this worked well. Time has to be set aside for this strategy because Karol must never move forward while there is tension on the lead and this means it could be a long session. There is no quick fix to what is the most common of all dog training issues. Patience, repetition, praise when the dog is in the correct position and a broad collar are a must. Bill’s puppy walker Chris has been busy changing jobs and so we haven’t seen much of Bill lately. However we did see him at the Devon show with Mary and Roger who looked after him while puppy walker Chris was away for the week. He was very confident and social and certainly looked the part.